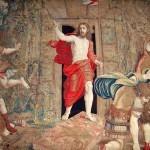 On Friday, March 4, from 2:00pm-5:30pm, Saint Joseph’s Seminary will host a workshop focusing on the processional chants of Palm Sunday, the antiphons for the washing of feet on Holy Thursday, the Reproaches for the veneration of the Holy Cross on Good Friday, and the Exsultet of the Easter Vigil. This presentation is ideal for parish musicians, cantors, music and liturgy directors, clergy (especially deacons), RCIA and religious education instructors, and all who wish to have a greater understanding of these beautiful works of sacred music. The cost of the workshop is $10. Registration may be found at the Liturgy Office website.